The studio behind Dark Meadow looks to push mobile graphics and gameplay to new heights. 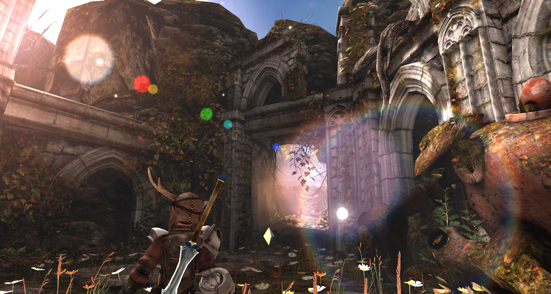 A Zelda-like experience on smartphones and tablets. That's what we took from seeing Zynga's Horn, the newest creation from Phosphor Games, makers of the hit iOS and Android release, Dark Meadow. Featuring a beautiful fantasy world populated by strange-looking monsters, this third-person title has a chance to not only push mobile game graphics to the next level, but also deliver a thoroughly entertaining quest that'll enthrall players thirsting for adventure. The story, loosely based on the Old English tales of King Horn (13th century), follows a young boy named Horn, a blacksmith's apprentice who has the unfortunate luck of finding his village overrun by gigantic creatures, but there's a twist. Turns out, these monsters are the people and animals from his town, the victims of a mysterious curse. That said, he grabs a sword, crossbow and musical horn and sets off to free them through 10 hours of story missions, nine levels and challenge modes. Accompanying him on the journey is a loud-mouthed and ill-tempered creature attached to his belt, which may create an interesting dynamic between warrior and, well, accessory. 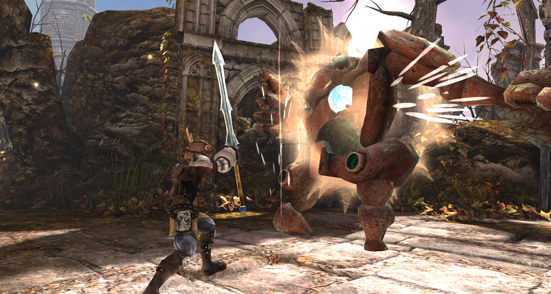 Although the game features visuals that bring console games to mind, it was created to work with smartphones and tablets. 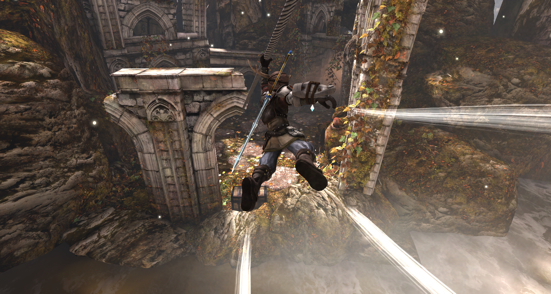 Accessible controls will be the order of the day, with auto jumping and various actions performed through intuitive gestures. This carries over to the touch-friendly melee combat and crossbow, where you'll swipe to attack while seeking to break an enemy's armor; you'll even get to climb certain adversaries. Defeat these abominations, and they return to their normal selves, be it human or animal. As for the Unreal Engine-powered world, you're free to go wherever you please, tapping areas and watching Horn move to those locations; there's no on-rails segments. On that note, feel free to explore, and be on the lookout for hidden areas and loot. While on the subject of items, Horn possesses the ability to build upgrades, giving you a chance to create weapon attachments. Finally, and as you can already tell from the screens, this is one visually arresting game. The team at Phosphor has thus far done an excellent job bringing these mysterious environments to life, with mountain ranges, ancient ruins, mechanical enemies, glare from the sun and a variety of plants dotting the landscape. If anything, there's plenty to look at. 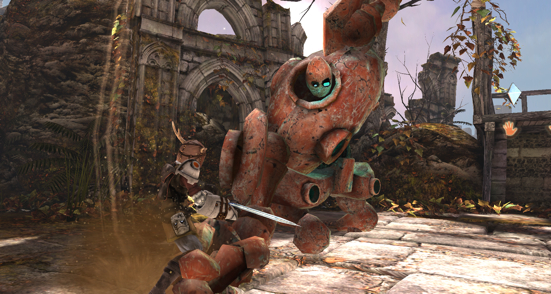 There may be just as much to listen to as well, thanks to a soundtrack written by Austin Wintory, who also did the hit PlayStation 3 effort, Journey. 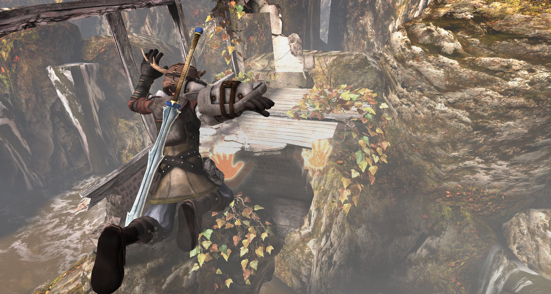 Taking all of this into consideration, we have very high expectations for Horn, and hope the developers can pull everything together to bring a Zelda-inspired title to mobile. With that, you can expect an overwhelming amount of details leading up to the game's, for now, unannounced release date.